In partnership with the Newcastle Jets, the School Sustainability Challenge is a pilot program designed to promote sustainable thinking in younger generations. Over 200 students from six Newcastle primary schools are putting their heads together to solve some of the toughest environmental problems right in their own schools. Students and teachers from participating schools each had a lesson on sustainability, learning about the ways in which they can reduce energy and water consumption and minimise waste, both in their school and at home. 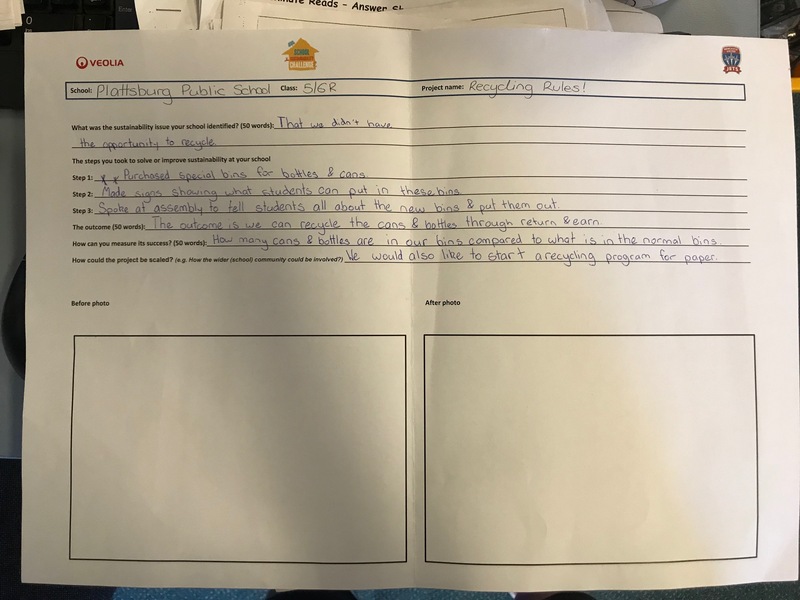 As part of the School Sustainability Challenge, they have one month to identify real-life water, waste or energy issues in the school environment, come up with a plan to tackle these issues and test their ideas. The projects will judged by the Newcastle Jets CEO, Lawrie McKinna, Lord Mayor of Newcastle Nuatali Nelmes and Veolia Australia and New Zealand’s CEO, Doug Dean. The entry which best fulfils the project’s criteria on process, measurement and scalability will be selected as the winner. The winning class will enjoy a money-can’t-buy prize courtesy of the Newcastle Jets, where they’ll get to meet the team and go on a behind the scenes tour! They’ll also win a $5,000 grant from Veolia to put towards their sustainable idea. Waratah Public School "Mulch Madness"
The Challenge: After their Jets and Veolia school visit, Class 5/6M were inspired to create a more sustainable school and future for themselves and realised this journey would only be possible through education and action. The Solution: This class focused on a holistic approach to sustainability, learning about upcycling and recycling, and looking at ways to reduce power consumption through simple measures like turning off lights. They built a small garden and created mulch from newspaper, reinstated the school worm farm, and set up a recycling station and a program for preventing books going to landfill called 'Book Bugs' - which they plan on extending to other grades at their school. You can read their submission by clicking on the link to the right. The solution: The students purchased special bins for bottles and cans, created and placed signs around the school and spoke about their initiative at a school assembly. The class also has plans to start a paper recycling program. Edgeworth Public School "Project Litterbugz"
The challenge: While this school already recycles paper, class 5W and 6L looked at ways in which they could start recycling plastic bottles. The solution: To reuse existing containers, collect the bottles and deposit them at return and earn stations. The money is being reinvested in the school’s fruit and veggie garden and to place more recycling bins around the school. As part of their plan, they’re now looking at the option of collecting plastic bottles from local businesses. Bishop Tyrell Anglican College "No Rubbish School"
The challenge: Year six students at this school focused on reducing waste. After collecting one day’s worth of rubbish they calculated the school was producing over 15 tonnes per year. The solution: By adding compost and recycling paper bins and taking non-recyclable items from their lunches home, this class drastically reduced their waste output, while also raising awareness back at home about how much rubbish is produced from school lunches. Click here to read their submission. St James Primary School "Water Wise Garden"
The challenge: Class 4W examined how they could reduce their school’s water consumption. After some investigation they realised certain garden plants require more water than others. The solution: The class designed new garden plantings and sourced drought-resistant plants to improve water efficiency and sustainability. To spread the conservation message further, they also created water-wise posters and placed them around the school.